assessing the ability and capacity of saline formations in the region to safely and permanently store nationally-significant amounts of anthropogenic CO2 using existing data. Additionally, the study will identify at least one specific site with potential to store at least 30 million tons of CO2 which could be considered further for a commercial or integrated demonstration project in the future. The project will also engage the public and other stakeholders for the region through outreach activities to apprise them of the study objectives and results. 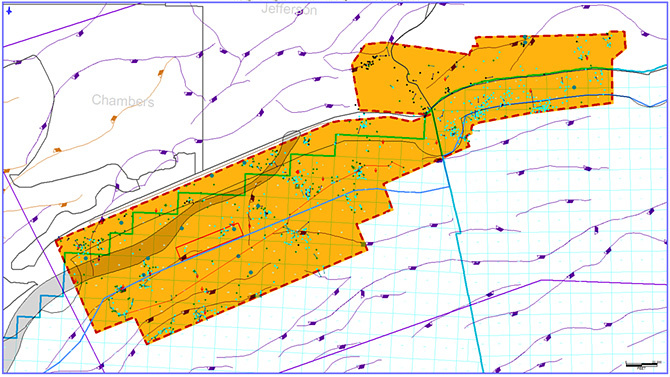 One major milestone of the project was to map the available seismic data in the Project's study area. The Project's main dataset comprises the "TXLA 3D seismic survey" whose survey outline is shown by the red polygon. The dataset was leased from SEI, Inc. for the duration of the project. Another important dataset is the "3D P-Cable Survey" whose survey outline is depicted by the blue rectangle. 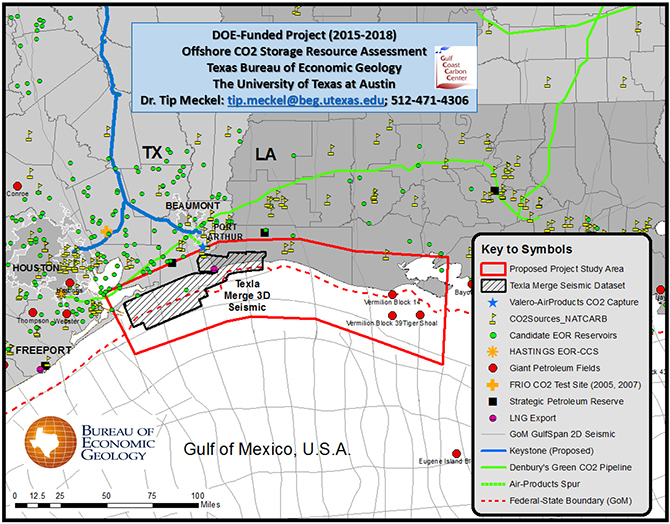 The P-Cable survey was acquired in 2014 as part of a previous NETL Project, "Gulf of Mexico Miocene CO2 Site Characterization Mega Transect." 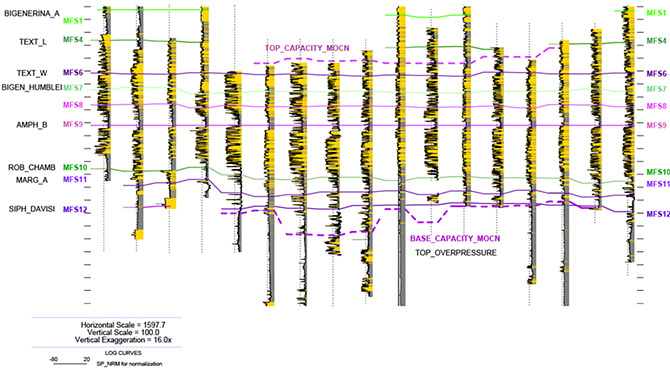 The P-Cable dataset lies geographically within the TXLA 3D seismic survey, but the former is a high resolution dataset that focuses on the shallowest (approximately) 1 second of the geological section; whereas, the latter, as per industry interest, focuses on the deeper geological section (i.e., where most hydrocarbon resources exist). Note that the "Additional 3D Seismic Surveys" and the "2D Lines" are publicly available datasets that were obtained from the U.S. Geological Survey (USGS). The initial well database for the current project incorporated a pre-existing IHS Petra© database that already contained many dozens of wells with wireline well log data (i.e., rasters and/or LAS - log ASCII standard digital curves) in the study area. There are 11,817 wells in the study area, 5250 of which have wireline well log raster data only (black dots). Of those, 4337 raster logs were purchased from vendor, MJ Systems, Inc. The purchased rasters are for wells in Vermilion and Cameron Parishes, Louisiana and Chambers and Jefferson Counties, Texas. There are 900 wells that have digital SP curves (green dots); 74 have digital gamma ray (red rhombs) and 7 wells have whole core (olive-green squares). The cyan colored dots represent wells currently without raster or LAS data. There are a total of 1091 wells within the seismic survey boundaries. Currently, 95 have well log rasters (black dots), but no LAS data. There are 252 wells with digital SP curves (green dots), 22 with digital gamma ray curves (red) and 14 with digital sonic and/or density curves (bluish). The sonic and density data can be used for the important task of time to depth conversion of the seismic dataset. 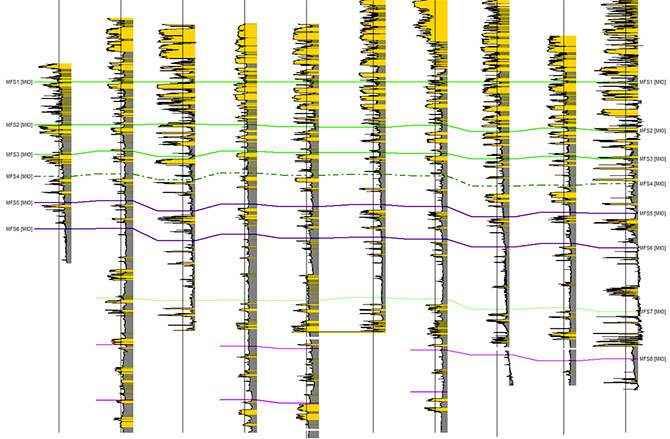 The well data have been used to correlate wells across the study area. The top figure is a regional stratigraphic cross section located in the near-offshore of the upper Texas and westernmost Louisiana coast. (See red line of section in figure above.) The cross section is flattened on the maximum flooding surface associated with biochronozone Amphistegina B (AMPH_B or MFS 9), an important and regionally extensive flooding surface of the region's lower Miocene section. Similarly, the lower figure is a regional stratigraphic cross section flattened on the Bigenerina A extinction horizon (MFS 1) and upper Miocene flooding surface. (See above for line of section.) Note that the nomenclature of each, respective, cross section is distinct because they result from different historical studies. Consequently, MFS1 is not equivalent to MFS 1 in the two figures below. With availability of more well log data, the intervening central portion of the study area (i.e., between the two regional cross sections) will be correlated to integrate the regional correlations in the two figures.